As financial resources for environmental management are limited, both UN Peacekeeping and UN Operational Support try to ensure that their interventions are appropriate, effective and cost-efficient. This calls for good management and up-to-date knowledge of the impact that its work is having on the ground. 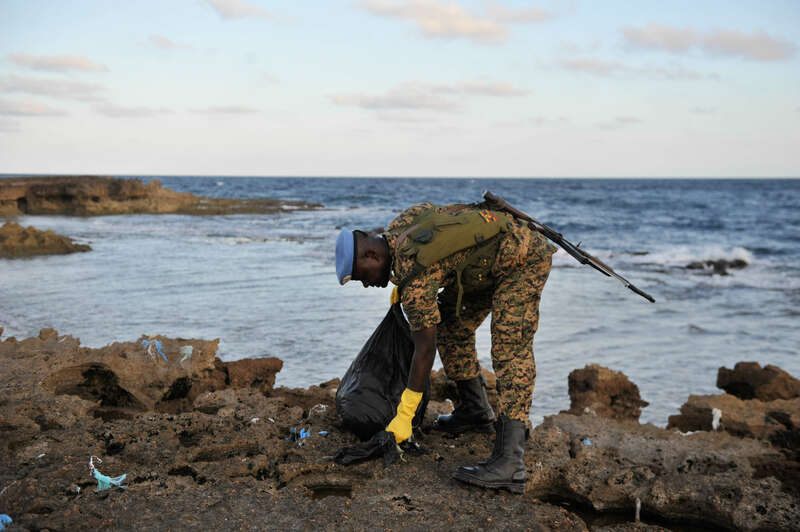 AMISOM/Omar AbdisalanStaff of the African Union Mission in Somalia (AMISOM) collect garbage during a beach clean-up exercise in Mogadishu. Best practices and case studies from the field are shared with all missions through a dedicated Community of Practice and dedicated training. We also use resources from our partners like UNEP or the Swedish Defence Research Agency (FOI) and from any other Member States or organisations. For more information on current practices in our missions, please check the latest Good Practice on environmental management in the field, as well as see how missions in CAR, Mali and Cyprus are mainstreaming environment in their operations in this video. The Department of Operational Support is an active member of the UN-wide working group on environmental sustainability management, and we promote Greening the Blue, the official UN campaign to make for a more sustainable United Nations. We have also partnered with the UN Environment Programme (UNEP) to take advantage of their long-time expertise in relation to the field to help us "greening the blue helmets".